Want to know what ‘VPN’ actually is? Then this guide is for you. If you haven’t got a clue about VPN or you know just a little bit then in this guide you’ll learn everything you need to know without all the complicated techie-jargon. Ever since its creation, the internet brought the promise of freedom. Online content was available to everyone, no matter where in the world they live. Couple that with companies and governments monitoring your every move and the internet has become a pretty scary place. … and it’s not just the serious stuff that’s restricted. Even websites like Netflix and news sites use geo-restrictions to lock content to specific regions. This has been going on for a long time now, and to combat it, developers around the world came together to create a technology to bypass the issue and allow users to remain safe and truly anonymous online. This technology has since become known as a VPN. 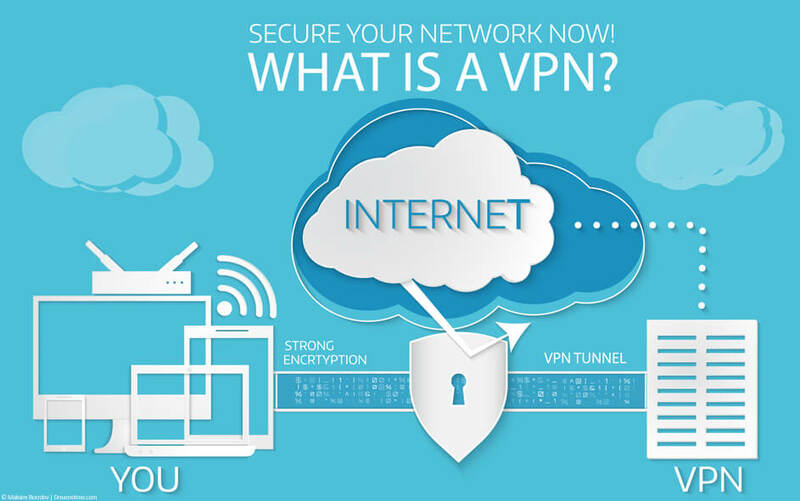 ‘VPN‘ stands for Virtual Private Network, and they’re provided by what are known as VPN services. Essentially that’s companies who sell the service to you and me. These are companies that create unique VPN apps which you can use on various devices such as smartphones, tablets, computers, and more. VPN can protect your online identity, and make you semi-anonymous while you surf the web. Using a VPN is as easy as 1, 2, 3. Further, they also hide your online traffic, making it impossible for anyone to know what you did while the VPN was on. At first, their use was mostly by those in the tech industry and business users, but as online censorship, restrictions, and even online dangers such as monitoring, spying, and hacking became a more significant threat, it has become a necessary tool for everyone in order to browse the internet safely. These days, there are many VPN services out there, all of them providing apps with numerous security features, all with the goal of protecting you and allowing you to remain safe online. 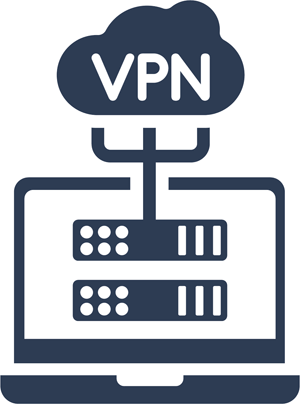 Different VPNs offer different security features, but there are three base features that all VPNs share. The first one includes security protocols, which work by creating a secure tunnel around your online traffic. The tunnel allows your traffic to flow freely, but it shields it from the outside view, thus making your online actions known only to you. The second security measure is encryption, which acts as an additional security layer. Basically, this means that distortion is added to your data, and if someone broke into the tunnel, your data would still be unreadable to anyone who might collect it. 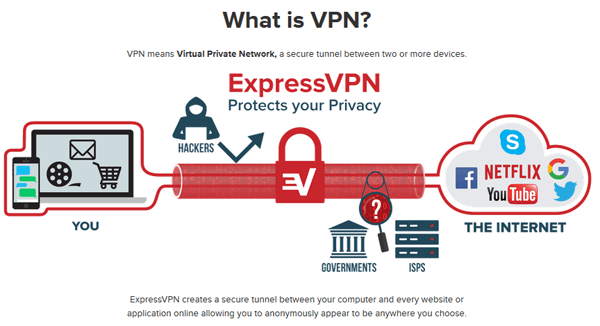 See the infographic below from our number 1 recommended VPN service, ExpressVPN that explains how a VPN works in visual form. The third feature is a server network, which replaces your real IP address with another one, owned by the VPN service. An IP address is like your internet phone number that links you to your online actions. This allows you to change your online location, and hide your identity simply by connecting to a new server, located in some foreign country. No longer what you do online can be attributed to you. As mentioned earlier, the internet is far from safe these days. As the hacking culture developed, large hacking attacks started collecting data belonging to other people and using it almost as a currency. This has made exposed data very valuable, and if yours ends up leaking, you may find yourself targeted by hackers and in the worse case this could lead to financial loss. Everything you do passes securely through a VPN ‘server’. Further, identity theft is also possible, with all of our information freely floating around. Next, the governments tend to spy on their citizens as well, checking on them in attempts to keep control. Many would claim that it is for a noble reason, but in many countries what they truly seek is to gather data, control, and manipulate. Finally, with a VPN, you can avoid issues like censorship, remain safe on public Wi-Fi, and even unlock services which your country has blocked. There are many VPN services around, as mentioned, due to the fact that VPNs have become a necessity for safe browsing. We compare five of them on our home page. New services are emerging all the time, but not all of them provide the same level of protection. Because of this, you should only trust recommended services. These are tried and tested providers who are also fast, affordable, and perfectly able to protect you and provide you with true internet freedom, which is a luxury that cannot be afforded without one such service these days. It is imperative to remember that not all of the VPNs are the same, and choosing the right one can be critical. There is no point in using a VPN that does a poor job when it comes to protecting you or keeping your online identity private. Because of that, you should use a list of criteria that a VPN needs to fulfill for you to even consider them. Cost – premium VPNs require a payment in order to be used, but that does not mean that you should pay any amount. There are many affordable services that do a good job. Logs – always pick a service that does not keep logs, as those that do can sell your information. Server locations – pick VPNs with large networks which have servers in as many countries as you’ll need. Devices – choose VPNs that cover the devices you use. Free VPNs are an option, but you should not consider them as they do not provide a good service. They do not offer good protection. They might sell your information or provide it if asked. That’s not even an exhaustive list but a round-up of the most serious issues. Find out more why free VPN services are not recommended. In most countries, VPN services are perfectly legal. Even countries that do not particularly support their citizens’ wish to unlock online content cannot ban VPNs because they depend on them as well. VPN works on almost every device. However, there are some countries where VPNs are openly illegal, restricted or exist in a gray area. There are not many such regions, but a handful does exist. This includes countries like China, Turkey, Iraq, Russia, Belarus, and North Korea. There are also countries where you can only use VPNs that have had approval, such as Oman, Iran, and the UAE. Most other countries do allow VPNs, however, so the chances are that you can use it safely. Of course, VPNs are not perfect, and they do have some negatives to them, even with all the pros that they bring. One such con is the loss of speed. This is a minor issue, and if your internet speed is at least average, you will hardly feel it. However, it does happen. Another issue is the fact that you should always remember to turn it on or off, depending on your situation. However, turning it on can be dealt with by choosing a VPN with auto connect feature. Is a VPN and a Proxy the same thing? No, VPNs are different than proxies. Proxies only allow you to mask your IP address to gain access to some restricted content, but they cannot shield your traffic or encrypt it, which leaves you completely open to everyone’s view. Is a VPN like my Firewall? Firewall is software which protects your computer from intrusion from the outside. Meanwhile, VPN protects your data flow and allows you to connect to different websites while your traffic remains protected and shielded from view. 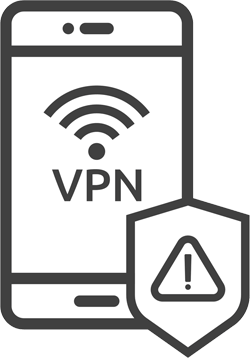 VPN is an online safety tool which you can use for protecting your online identity and keeping your online actions private. It is necessary due to censorship and various online dangers. 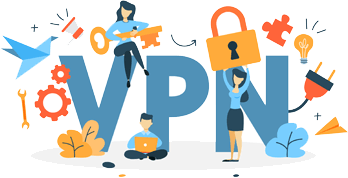 There are many VPN services you can choose from, but you must ensure that the one you decide to go with can protect you adequately. If you’re looking for a secure and highly rated VPN, check out our three recommended services.